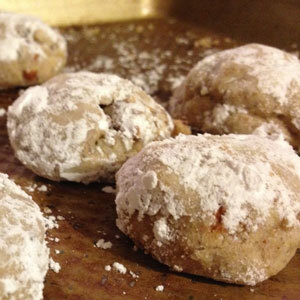 Here at Wanderlust, we like to get a little meta with our food – for example, we recently put tea in our tea cookies. Because nothing goes better with your tea and Russian tea cookies than studding them with…more tea! Seriously though, this recipe was a fun experiment to welcome a friend of mine back to the office. He’d been serving jury duty for a couple of weeks, and nothing says “Hey, we missed you!” better than homemade baked goods. A big thank you to Laura on these – the final step of rolling these in confectioner’s sugar while still warm is a trick of her grandfather’s, who ran a bakery in Wisconsin. It adds a fun flavor enhancement to these bite-size, almond-rich treats. I needed to use the food processor to chop my almonds, so I decided to make the whole recipe in it. I’m delightfully lazy (and a dish conservationist). Chop up the almonds in a food processor. Set them aside. Add the sugar and tea to the food processor and process for a minute or so. Add the butter, vanilla and almond extracts and process until creamy – scrape with a rubber spatula if you need to. Blend in the dry ingredients, then fold in the nuts with a spoon or rubber spatula. Roll the dough out into two balls. Wrap in plastic wrap and chill for at least 1 hour in the refrigerator. When ready, flatten out the dough and cut it into 15 to 20 equal size pieces. Shape the pieces into balls and place on an ungreased cookie sheet. Bake at 375 degrees for 10 to 12 minutes until firm but not brown. While still warm, roll in confectioner’s sugar. Let cool completely, then eat! Makes about 36 cookies. Truth: These are profoundly delicious. Up For Debate: Heather’s success as a dish conservationist. All of the dishes! Though I guess I can’t really talk. They went over well at work, too. And hey – my dish-saving skills are reknowned far and wide! !